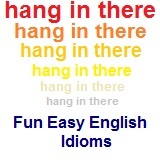 ﻿ Fun Easy English - new american english idioms letter m.
In this lesson you will learn American English idioms beginning with the letter M. You will learn the definition and study the usage of each idiom. mad as a hornet very angry He was mad as a hornet when I saw yesterday. made a hit was popular Her cake made a hit at the party. make a beeline go directly and quickly She will probably make a beeline to the travel section. make a bundle make a lot of money He could make a bundle on the stock market this year. Whereas make a clean breast of it concerns a wrongdoing, get something off one’s chest refers more generally to one’s troubles, worries, or concerns. The expression suggests that guilt is kept in one’s breast (heart) and that by revealing one’s guilt, one cleans one’s breast. 1. The thief admitted to the judge that he was guilty and told him the whole story of his crime. He made a clean breast of it. 2. The children had lied about taking the candy without permission. They eventually went to their father and made a clean breast of it, telling him everything. make a day of it stay the entire day We decided to make a day of it at the park. make a dent make progress It seemed like we did not even make a dent towards completing the project. make a difference change anything It does not seem to make a difference if we talk or not. make a go of achieve success in He is trying to make a go of the business even though he is losing money. make a killing make a lot of money You can make a killing in Las Vegas. make a living make enough money You cannot make a living at your present job. MAKE A LONG STORY SHORT to summarize; to tell only the main points 1. To make a long story short, I think your idea is terrible. 2. He tried to make a long story short, but she wouldn’t let him finish. make a mistake make an error Try not to make a mistake on the exam. A molehill is a very small pile of dirt made by a small animal, a mole, which digs tunnels underground. To think that a molehill is as large as a mountain is to greatly exaggerate. 1. I know you feel hurt because Jean didn’t invite you to her wedding, but it was a very small wedding, with just family members and very close friends. You’re making a mountain out of a molehill if you get upset about it. 2. The clerk gave me the wrong item, then he charged me the wrong price and gave me the wrong change. Should I complain to the manager about him, or am I making a mountain out of a molehill? make a name for oneself become famous She is trying to make a name for herself in the field of literature. make a pass at someone make romantic advances to him She tried to make a pass at him and lost her job. make a point of have the intent of You should make a point of doing your homework every night. make a run for it leave quickly I think that she will make a run for it as soon as the class finished. make away with leave with The bank robber tried to make away with the money. make believe a pretend game The children were playing make believe. make do with substitute You have to make do with milk instead of cream. Both keep one’s head above water and make ends meet mean having just enough money but no extra, although the former conveys a feeling of desperation. Keep one’s head above water can also mean survival in situations other than financial, whereas make ends meet is limited to financial survival. 1. We can hardly pay the rent, buy enough food, and keep the children in clothing. We’re barely making ends meet. 2. Roger was unable to support his family on his teacher’s salary. He made ends meet by taking a second job. The head is the top or front of something, while the tail is the bottom or back. In use since the 1600s, the phrase make heads or tails of something means to understand it from beginning to end (top to bottom). The expression is usually used in the negative or in question form. 1. I can’t hear you clearly because the telephone connection is bad. I can’t make heads or tails of what you’re saying. 2. First Louise turned the book one way, then the other. She couldn’t make heads or tails of the picture she was looking at. The expression suggests that when one is very angry, one’s blood gets so hot that it boils. 1. I had told Fred never to borrow my car without permission again, but he did it anyway. That makes my blood boil. 2. The secretary could hardly believe what one of the office workers had said about her. She was angrier than she could ever remember being before. It made her blood boil. The expression is often used in reference to something good to eat (sentence 1), but it can also be used figuratively (sentence 2). 1. The chocolate in the display window looks delicious. It makes my mouth water. 2. Charles had been saving his money, and now he was so close to being able to buy the sports car he wanted, it made his mouth water. He could practically taste it. Compare to: turning point 1. The Smiths were about to sell their house, but the buyers didn’t like the color. The Smiths decided to give it a new coat of paint at no extra cost, in case painting the house might make or break the deal. 2. Susan decided to study for the test through the night. She knew that her grade on this test would make or break her chances of getting admitted to graduate school. The expression make something from scratch is usually used to describe baked goods (sentence 1). Something made from scratch is considered to be superior to something pre-made, because it is probably made more carefully and with the best ingredients. 1. My mother never buys cake mixes or ready-made cookies at the supermarket. She always buys the flour, sugar, butter, and eggs, and makes cakes and cookies from scratch. 2. George didn’t use a kit from a store to build a playhouse for his children. Instead, he designed the playhouse himself, bought all the materials he needed, and made it from scratch. Whereas make the grade and up to snuff can be used to describe both people (sentence 1) and things (sentence 2), cut the mustard is usually used with people. 1. Of the ten semifinalists in the competition, only three made the grade to become finalists. 2. At the end of many manufacturing processes, people check the quality of the goods produced. If the final products don’t make the grade, they have to be thrown out. Compare to: beat a hasty retreat 1. We have no reason to stay around, so let’s get going. Let’s make tracks. 2. The boys were playing catch when they accidentally broke one of Mr. Carson’s front windows. You’ve never seen two boys make tracks as fast as they did. main drag most important street The best hotels in Las Vegas are located on the main drag. make waves cause trouble Try not to make waves around the office. The expression originates from the military command “Mark time!” in which soldiers march in place, i.e., move their feet up and down (go through the motions of marching) without moving forward. 1. Richard isn’t interested in making a career out of the army. He’s just putting in the minimum amount of time, marking time until he can leave. 2. Carol doesn’t particularly care for the job she has now, so she’s decided to mark time until the job she really wants comes along. maxed out exhausted I am maxed out at my work and need to rest. means business is serious The boss means business when he says to finish the project. mellow out relax You need to mellow out and enjoy life. Antonym: rhyme or reason, no 1. There is some method to her madness. It’s just difficult to understand her way of doing things. 2. There is a method to my madness. I like to work on difficult jobs in the morning, when I have the most energy. I save all the simple, boring tasks in the evening, when I need less brain power. The expression originates from the story of Midas, a mythological king of Phrygia, who was given the power to turn anything he touched into gold. 1. Everything Linda does is a success. She really has the Midas touch. 2. When it comes to investing money and buying stocks, they have the Midas touch. It seems like everything they buy goes up in value. A millstone is a very heavy stone on which one grinds grain in a mill. If a millstone were tied around one’s neck, it would be a great burden. 1. My elderly parents’ house is a millstone around my neck. They are unable to keep it up and I have to do all the repairs myself or pay someone to do them for me. I wish they would sell the house and rent an apartment instead. 2. This year’s taxes have become a millstone around my neck. If I had just gotten them done early, they wouldn’t be stressing me out now. Synonyms: none of (one’s) business! The expression mind your own business is a common response of annoyance at a prying or rude inquiry. It is a very direct, even rude, response, and is only used between people of equal social standing. 1. Sarah started to ask them some very personal questions. They told her to mind her own business. 2. They were just sitting on the bus bench, minding their own business, when a stranger approached them and started telling them his life story. to miss an opportunity because one is too late 1. I saw the furniture advertised on sale, but I didn’t get to the store in time to buy it. I missed the boat on that one. 2. Daniel plans to apply for college at the last possible moment. If he doesn’t allow himself enough time, he’s going to miss the boat. The expression suggests that one has so much extra money that one can afford to burn it. 1. The company managers are taking us all out to an expensive restaurant for lunch. They must have money to burn! 2. I have to be careful how I spend my money. I don’t have money to burn. Monkey around emphasizes curiosity or the climbing aspect of play whereas horse around emphasizes the physical nature of play and clown around means to act silly. Fool around is the most general of these and could substitute for the other three. 1. The children have to play in their bedroom. The living room is not for them to monkey around in. 2. Steve likes to monkey around with old cars to see if he can fix them. Synonym: hanky-panky Compare to: monkey around 1. The boss wasn’t sure, but he suspected that there was some monkey business going on with the company accounts. 2. The children had become very quiet in the playroom and their mother decided it was time to see what kind of monkey business they were up to. MORE THAN MEETS THE EYE some hidden aspect to a situation 1. I can’t see any reason why this man on the telephone is trying to give me a free vacation. There’s more here than meets the eye. The expression is often used in a negative sense, i.e., more money, more trouble, more work, etc. than one expected or wanted. 1. I agreed to join a book club because the saleswoman said I didn’t have to buy any book I didn’t want, but I was shocked when I learned I had to spend a certain amount of money every month. It was more of a commitment than I bargained for. 2. I thought you were looking forward to being in the army. Was it more work than you bargained for? MORE THAN ONE WAY TO SKIN A CAT, THERE’S there are different ways to accomplish the same thing; there are different possible solutions to a problem 1. There must be some way to raise enough money to buy a car. We’ve put all our savings together but it isn’t enough. Still, there’s more than one way to skin a cat. I’ll get a second job! The expression suggests how hard one would have to try if one tried to move things as big as heaven and earth. 1. The young man was accused of a terrible crime. His parents were convinced that he was innocent and swore they would move heaven and earth to get him acquitted. 2. Linda’s daughter is getting married on Friday, the same day Linda gets back from an out-of-town business trip. She will move heaven and earth to get to the wedding on time. munch out eat a lot I think that we should munch out at the buffet. Hey do you know any English idioms beginning with the letter M not listed on this page?